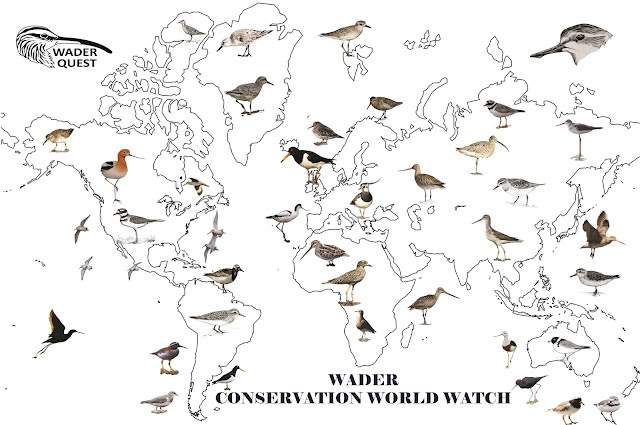 Wader Quest: Wader Conservation World Watch is next weekend! Wader Conservation World Watch is next weekend! We are and we have, we are going to be at the Walney Wader Festival in Cumbria which we are very much looking forward to and hope to see many of you there. Support received from around the world. In the Philippines the Haribon Foundation will be making an event of it again this year, which is fantastic. We have always had a great deal of support from Australia and New Zealand and this year will be, all being well, no exception. We have people preparing for days out from Chile to Anguilla in the Caribbean and from Brazil to Peru in South America including Argentina, Ecuador, Venezuela and Paraguay. In Central America we will be joined by birders in Mexico and in parts North America too there will be folk out across the continent in the USA and Canada. In South Africa, our friends from Wader Quest South Africa and Nature's Valley Trust will be out and about as will people in Kenya and The Gambia and also the off island of Mauritius. Asia will be strongly represented with people dusting off their bins in India, Taiwan, Japan, Thailand, South Korea, Malaysia and Indonesia to name but a few places. Europe will also be represented with people in France, Spain, Belgium, The Netherlands, Sweden, Cyprus and Bulgaria already on board with hopefully more to join them and naturally as we have a big support base in the UK and Northern Ireland, there will be many reports from here. Is your country mentioned? If not get in touch and make this a truly world-wide event. 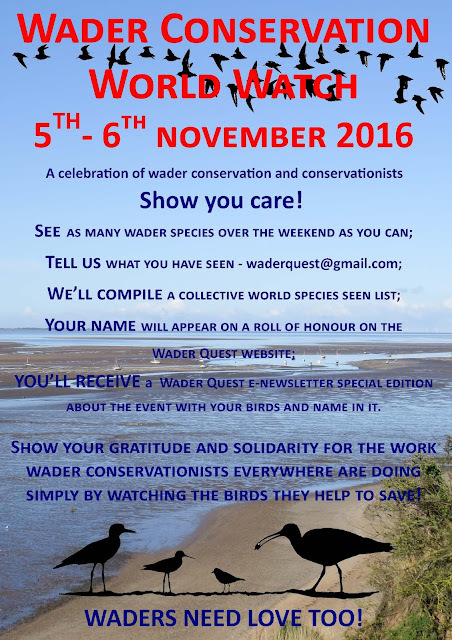 Why not become part of this growing worldwide phenomenon, the celebration of waders, their conservation and the people who do it? Go out and see waders - there is NO NEED to count them if you don't want to, just enjoy them. Let us know what species you saw and where. We will do the rest by creating a worldwide list, a roll of honour for the weekend with every participant's name on it and then produce a 'Wader Quest the newsletter' special about the event which will go to all participants. You may like to consider putting your sightings on eBird or BirdTrack to help with worldwide citizen science. Farei no litoral do Maranhão, Brasil.